Non-Native Milkweed: Helpful or Harmful? You are here: Home / General Interest / Non-Native Milkweed: Helpful or Harmful? 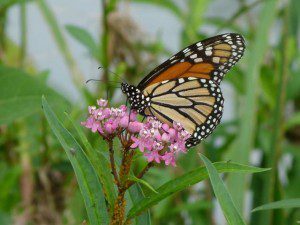 The most recent article about the monarch butterfly in the New York Times has once again raised the question of whether we should be planting non-native milkweed. The milkweed being discussed was the tropical variety most widely available in the usual stores, Asclepias curassavica, known commonly as Scarlet or Tropical milkweed. Ongoing research points to problems with this plant that are mounting as time goes by including increased presence of the deadly parasite OE, (Ophryocystis elektroscirrha). 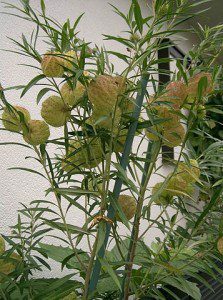 Asclepias physocarpa is actually Gomphocarpus physocarpa. It is an African native milkweed that has been introduced into Australia and elsewhere and the monarch butterfly is able to lay eggs on it and its caterpillars eat it without negative effect as far as is known. When I was at Amherst College, I raised monarchs on it for experimental purposes. My advice is that because it is a non-native plant and because monarchs that feed on it will carry different chemical fingerprints from those reared on native milkweeds, and because it may possibly act as a physiological trap for monarchs during the fall and spring migrations, I advise against encouraging its use as a monarch garden food plant. I also am against planting Asclepias curassavica, (Mexican Butterfly weed, Blood-flower, Scarlet milkweed, Tropical milkweed) out of its range. NOTE: Since last year, as mentioned in the above referenced NYT article, Sonia’s predictions of negative results are being supported by numbers in her research. The following article, also by Lincoln Brower is reprinted here with his permission. There are disagreements and conflicting hypotheses amongst both professional and non-professional monarch folks in regard to the wisdom of the current widespread planting of Asclepias curassavica in butterfly gardens. In reading through posts on Monarch Watch, it is resoundingly evident that no study has yet been done which strongly supports or negates the hypothesis that I have put forward. if incorrect, then planting it likely does not detrimentally effect the breeding biology of the monarch. As Chip Taylor implies, many variables need to be controlled. I do not buy his argument that what happens in a Kansas garden is evidence against the detriment hypothesis because of the latitudinal difference between his garden in Lawrence, Kansas and my former gardens in Gainesville, Florida. Because monarchs can not survive in areas that are severely frosted, what is crucial to resolve is what actually happens during the fall when migrating monarchs encounter extensive plantings of curassavica in the south. What is needed to resolve the issue are carefully designed experiments. Among aspects that the experiments must consider are: latitude, day length, rate of change of day length, sun angle above the horizon and the natural phenology (changes in individual plants through time) of the native milkweeds. For example when do the native milkweeds die back because of natural frosts or due to the dry season effects? How long do the native milkweeds remain dormant while the curassavica are protected? Also, what was historically natural can be distorted by agricultural activities (e.g. haying) that cause the native milkweed species to re- sprout. If one approaches the problem that there MAY be a negative effect of propagating curassavica widely, then it would seem that caution is on the side of wisdom. Just because curassavica is easily cultivated does not justify increasing its geographic range and abundance.Taylor is correct that curassavica is a native milkweed in the Neotropics, and that monarchs have co-evoved with it. But these two facts actually argue against planting curassavica widely beyond its natural range in temperate North America.In conclusion, we are not going to solve this issue without carefully controlled experiments. Many thanks to Lincoln for his generous and timely response to our questions. Because there is serious concern by researchers that it could be detrimental to the future of Monarch butterflies, caution is recommended in deciding to incorporate non-native milkweeds into our Virginia gardens. Native milkweeds will assuredly be beneficial in all ways, and will also do no harm. Well done! Why people are so stubborn and insist on planting the non-native varieties is beyond me. Why not just make the extra effort to track down a native variety that you KNOW will have no negative impacts. The scientific consensus is that we are billion milkweed short of what we need to significantly bring back milkweed numbers. And our native plant friends continue to argue based on little and a non-replicated study that tropical milkweed is “bad” for monarchs. This is an ill founded conclusion and at a time when we all should be planting as many milkweed as we can the discussion about what milkweed is best is ill timed and in my opinion foolish. We shouldn’t plant non-native milkweeds for the sake of native ones, not just for the sake of monarchs. Why is it that we care so much for the e charismatic species, the butterfly, and don’t care enough for the native species of milkweeds? Beatriz, why do you have to imply that people who plant non-native milkweed are doing it at the expense of native milkweed varieties? We have about 15 varieties of milkweed throughout our garden (both native and non-native) and the only one that has ever threatened to overtake other species is the native common milkweed….which, by the way, I would never dream of removing from the garden landscape. Our garden has seen a steady (and at times, remarkable) number of monarch visitors along with many other pollinators, when many others who follow your natives-only gardening advice see and support much less. Those who have learned to integrate the best of both into our gardens know the truth from our experience…and we’re more than happy to host all your butterflies. Mastery of gardening means you’ve learned something about what happens inside your fence. To keep history from repeating itself by creating yet another noxious weed or agricultural pest, its imperative to also learn how your actions impact nature BEYOND your fence. That’s the difference between “invasive” to a gardener, and “invasive” to an ecologist. Back in the day, there were worries over pallet wood from Asia maybe causing trouble. These worries were poo-pooed in favor of cheap shipping costs, and after all, there was no evidence there was a problem. Today we have the Emerald Ash Borer taking out the US ash forests, and wake in cold sweats at the thought of the Asian Long Horned Beetle going after our maples the same way. Who knows how non-natives might establish a vector for parasites or take out players in native plant communities? Of course its speculation! And its’ GOOD speculation, because ecology teaches us that nature is a system, and history teaches us that tweaking the system with non-natives results in unpredicted changes, sometimes at great cost. Butterfly gardeners must stop thinking they’re “expert” just because they can grow stuff within their boundaries, without regard to the unexpected consequences for everyone else beyond them. Tropical milkweed probably poses fewer problems in the northern monarch breeding range because it dies back naturally when it freezes. OK, you’ve cautioned us against planting A. currassavica in the FL gulf coast areas. What is an acceptable alternative is native to our region? Most of what is available is the A. currassavica. Would cutting this plant to the ground in cooler Dec. & Jan. be beneficial~acting somewhat like the Milkweeds dying off up north? Would the new growth in Spring be free of OS? Seeking guidance here! What do you consider north? I’m a little north of Columbus, Ohio. A few years ago, I had tropical milkweed in my yard and monarchs quit migrating to lay eggs on it. When the hard freeze came, there were still monarchs on the tropical milkweed. The tropical died along with some of the cats. Others lived but no longer had milkweed. Tropical milkweed should be avoided.